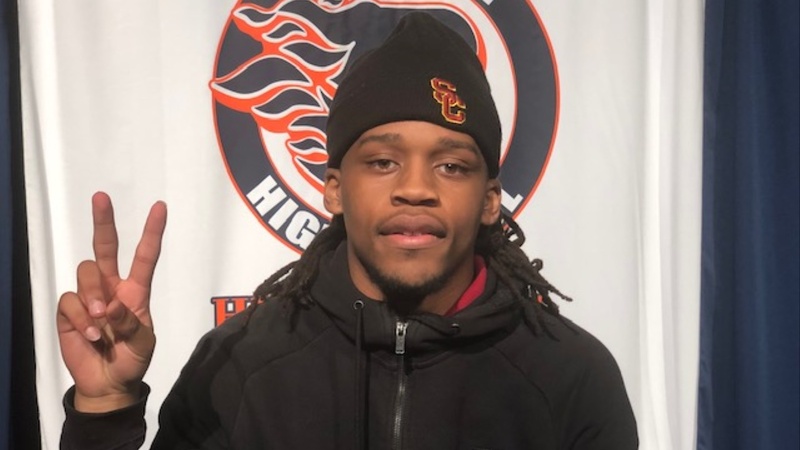 A year ago putting on a USC hat and signing with the Trojans on National Letter of Intent Day wasn’t even a remote thought for DB Adonis Otey‍. The Trojans didn’t show any interest in the four-star athlete until late in the recruiting process. The interest from the Trojans got serious enough to where they offered Otey a scholarship last month. That offer led to an official visit and the visit led to him signing with USC today at Blackman HS in Murfreesboro, TN. Although Otey’s interest in USC was high before he took the official visit two weeks ago, the thought of him attending school far from hom troubled his mother. But she was won over after the academic presentation USC gave. His father was also extremely impressed with what USC offers after football. Being on the West Coast will also be a bit easier for Otey with an uncle living 20 minutes from USC’s campus and more family in northern California. TrojanInsider.com attended Otey’s signing-day ceremony Wednesday and spoke to him after. Otey talked about his official visit, what led him to take it, why he ultimately chose the Trojans over Arkansas, what role USC sees him playing and much more.